Syracuse University’s Remembrance Scholar Committee has chosen the 35 students who will be the 2015-16 Remembrance Scholars. 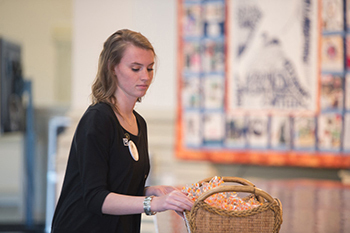 A convocation for the 2015-16 Remembrance Scholars will be held Oct. 30 in Hendricks Chapel. The scholarships were founded as a tribute to—and means of remembering—the 35 students who were killed in the Dec. 21, 1988, bombing of Pan Am Flight 103 over Lockerbie, Scotland. The students, who were returning from a semester of study in London and Florence, were among 270 people who perished in the bombing. The scholarships are funded through an endowment supported by gifts from alumni, friends, parents and corporations. Significant support for the Remembrance Scholarships has been provided by C. Jean Thompson ’66 and Syracuse University Board of Trustees Chairman Richard L. Thompson G’67 in memory of Jean Taylor Phelan Terry ’43 and John F. Phelan, Jean Thompson’s parents, and by the Fred L. Emerson Foundation. Remembrance Scholars are chosen in their junior year through a rigorous, competitive process. Applicants write three essays as part of a comprehensive application, and finalists are interviewed by members of the selection committee, composed of University faculty, staff and students. The $5,000 scholarships are awarded on the basis of distinguished academic achievement, citizenship and service to the community. The scholars will be recognized during a convocation in Hendricks Chapel on Friday, Oct. 30. Additionally, the 2015-16 Lockerbie Scholars, Joanna Barrie and Ellen Boomer, were recently selected. Each year, two students from Lockerbie come to Syracuse for a year of study through the Syracuse-Lockerbie Scholarships, jointly funded by Syracuse and the Lockerbie Trust.